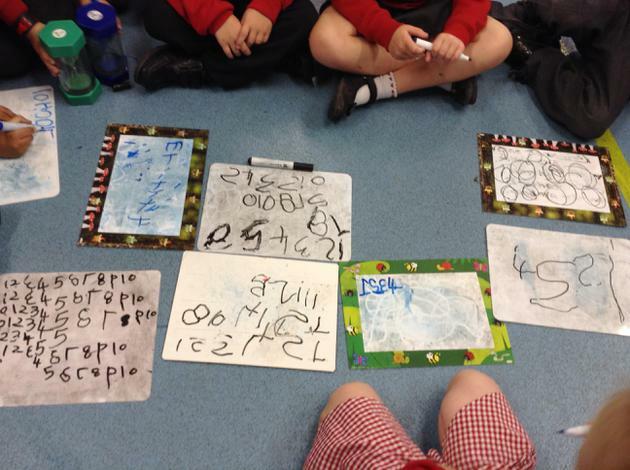 We've been working hard this week. 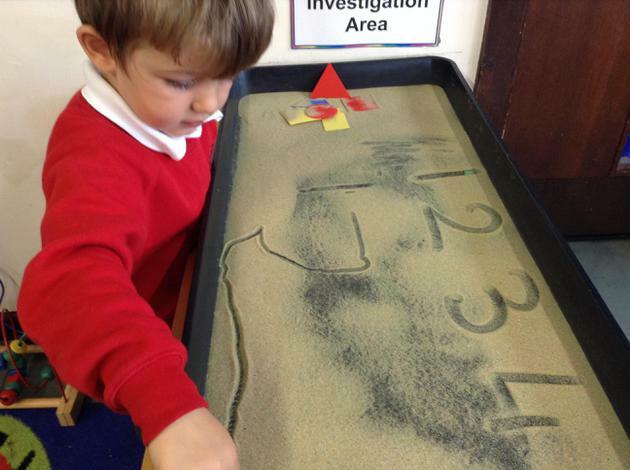 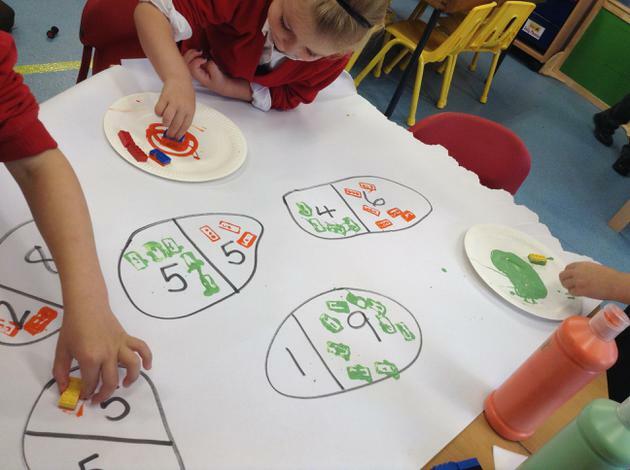 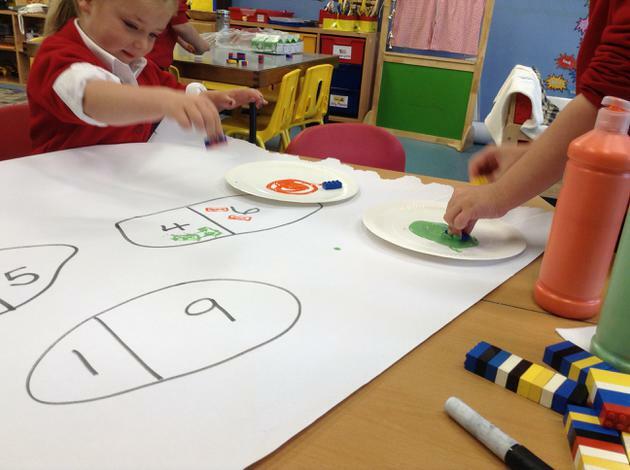 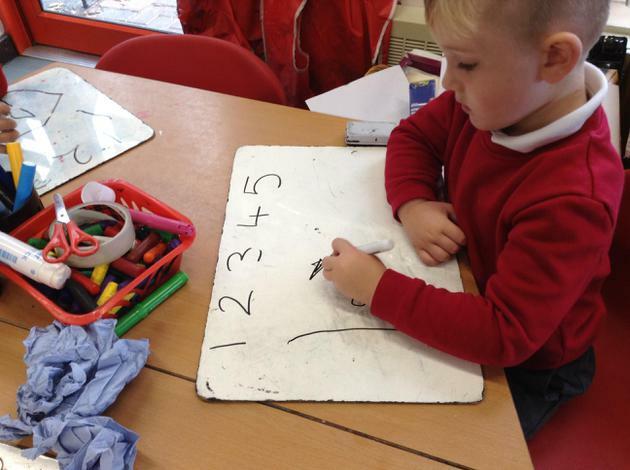 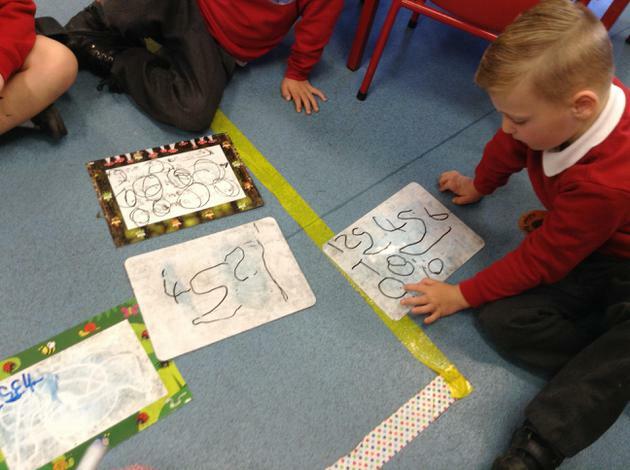 Lots of us have been writing numbers, searching for numbers around our classrooms and trying out different calculations. 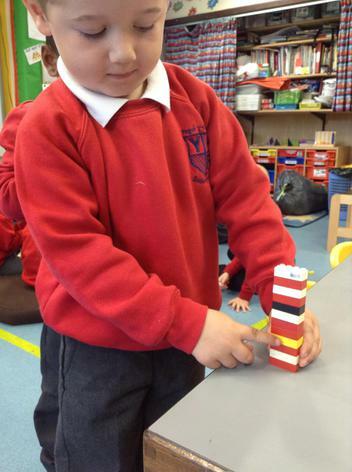 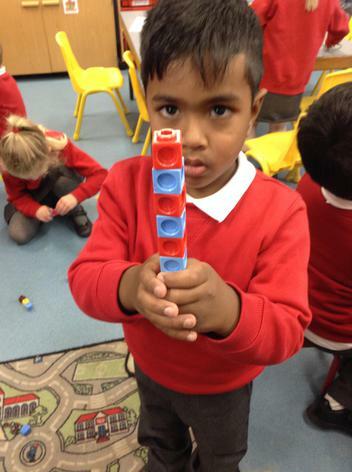 We've made Towers of Ten, some of us worked out how to quickly check we had the right amount by matching the towers heights. 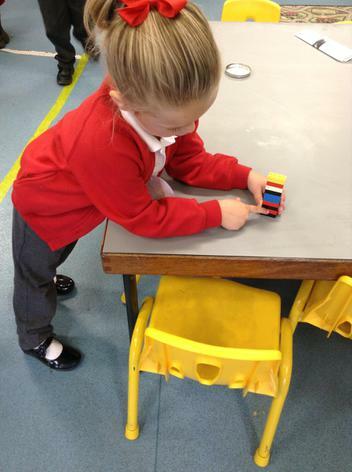 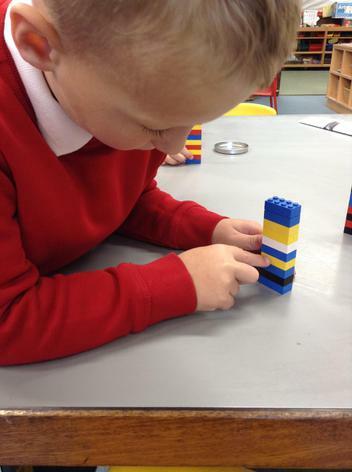 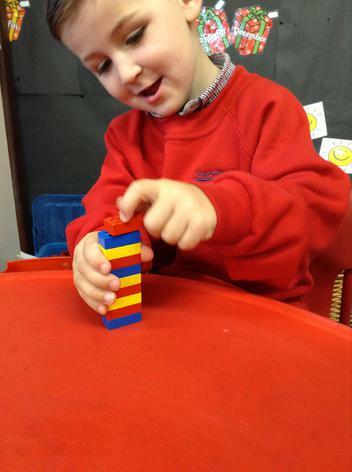 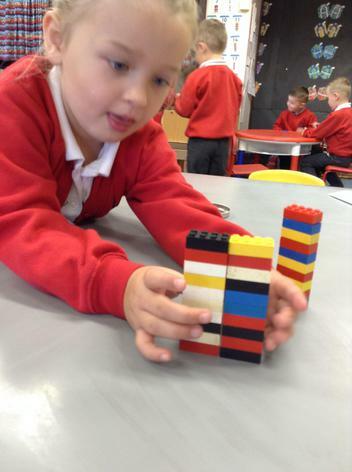 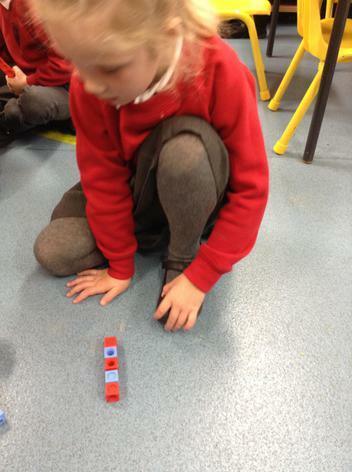 We also used Lego pieces to print different ways to make 10. 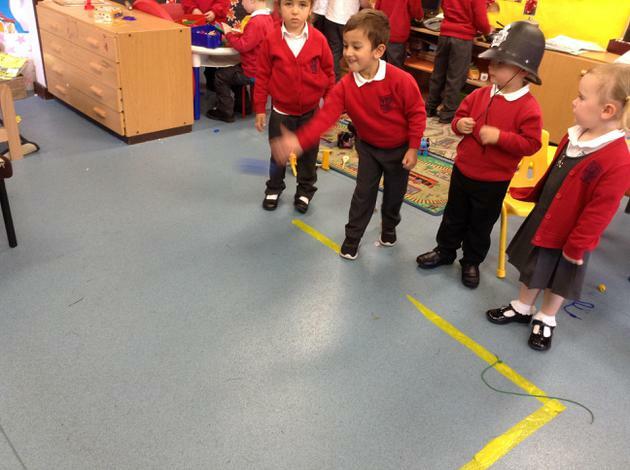 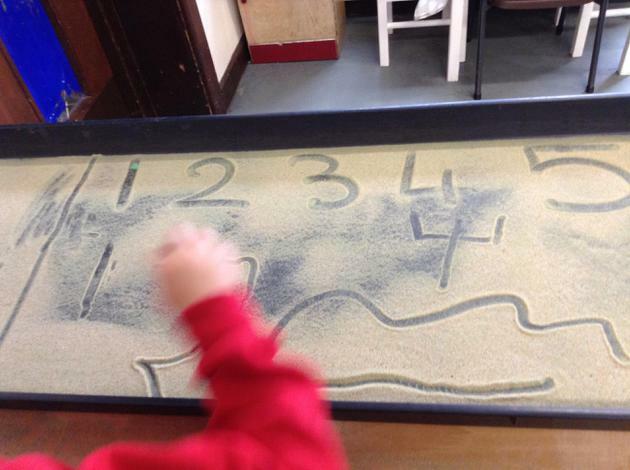 Lots of us loved driving remote control cars to different numbers in the Challenge Zone. 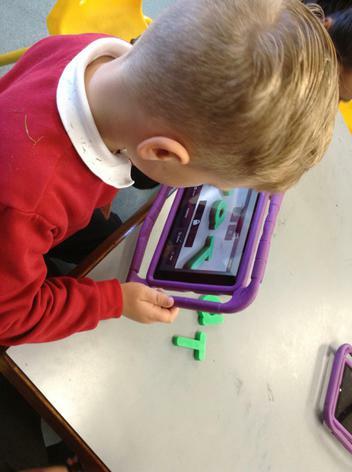 Mrs Harvey showed us a maths app that helps us recognise numbers and was a lot of fun. 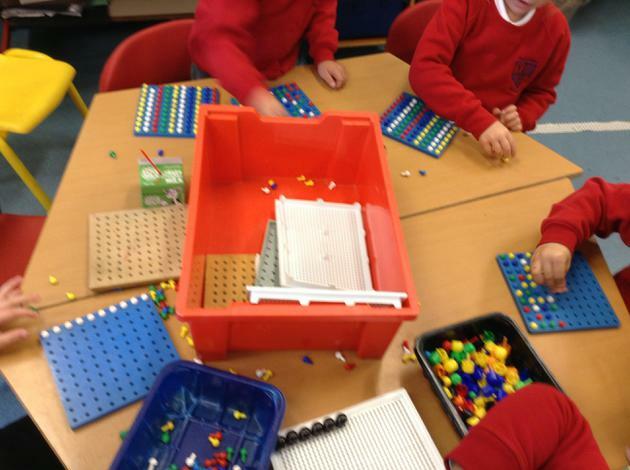 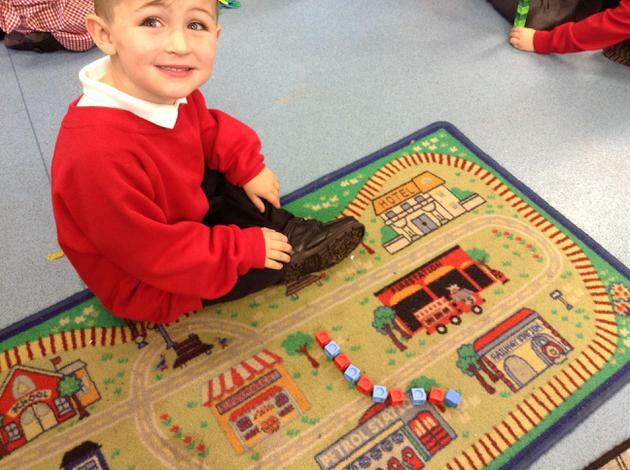 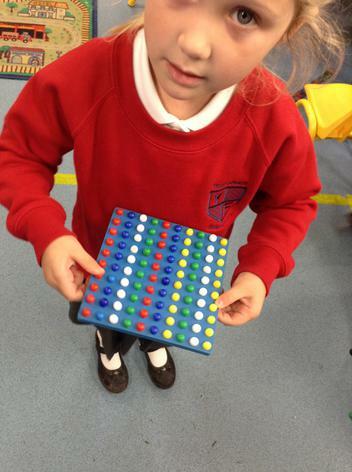 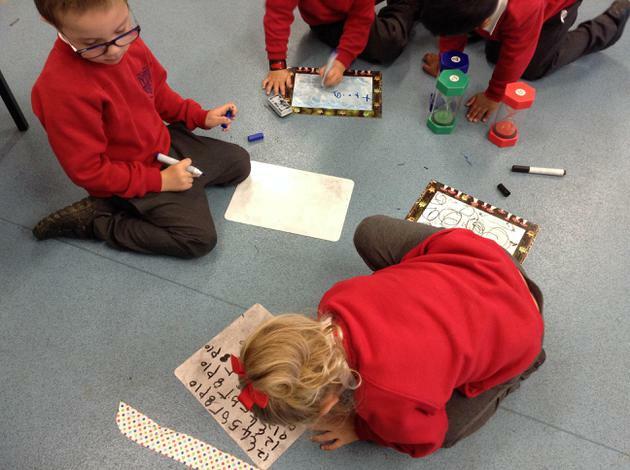 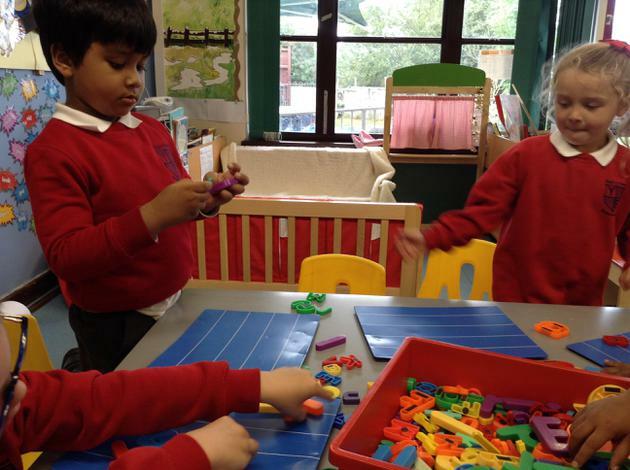 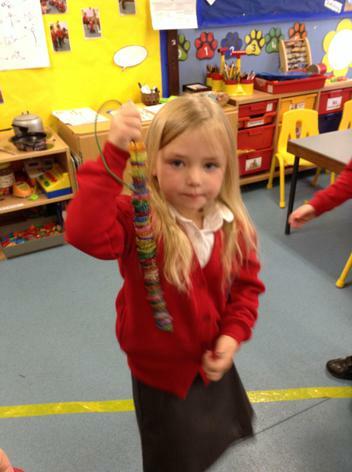 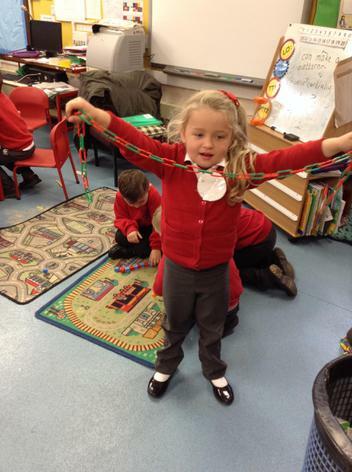 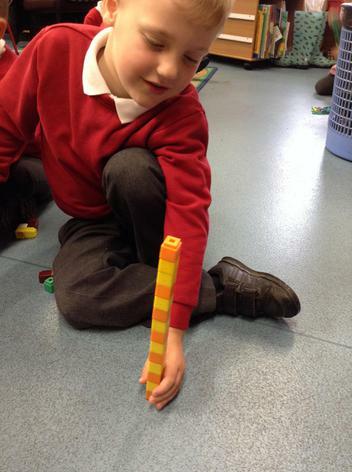 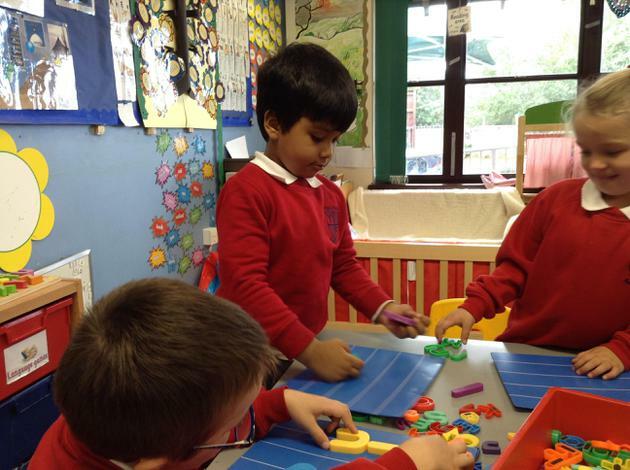 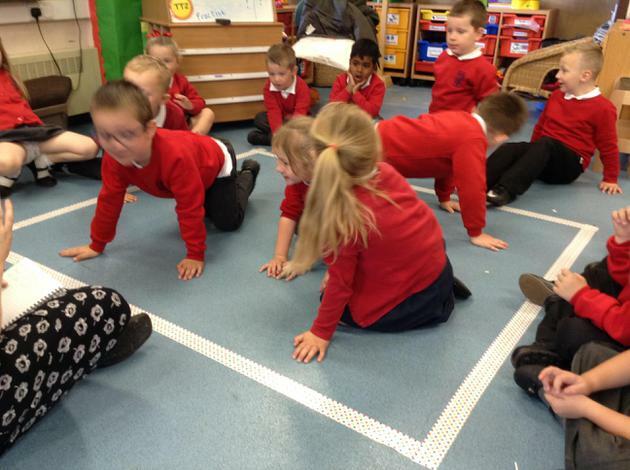 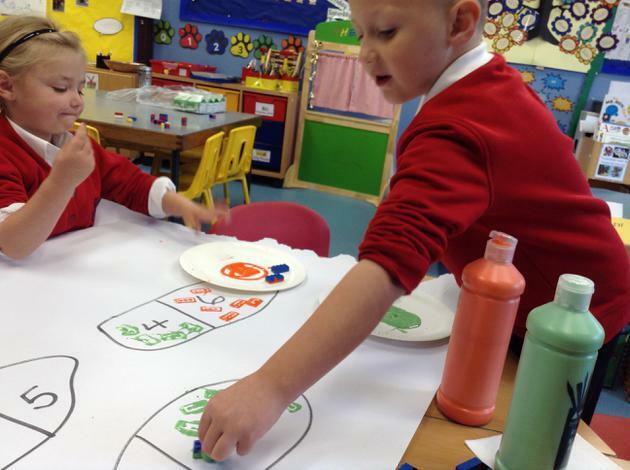 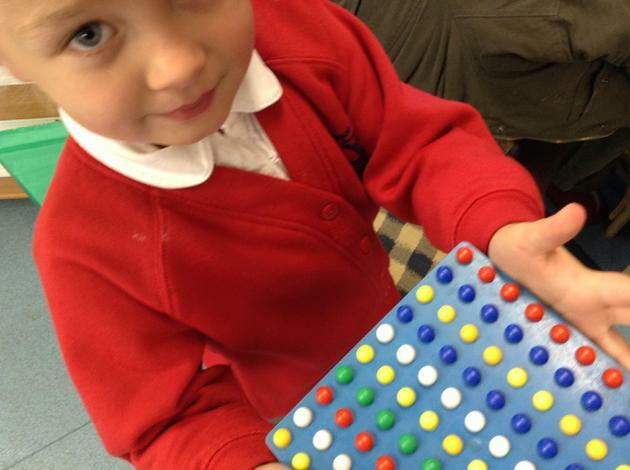 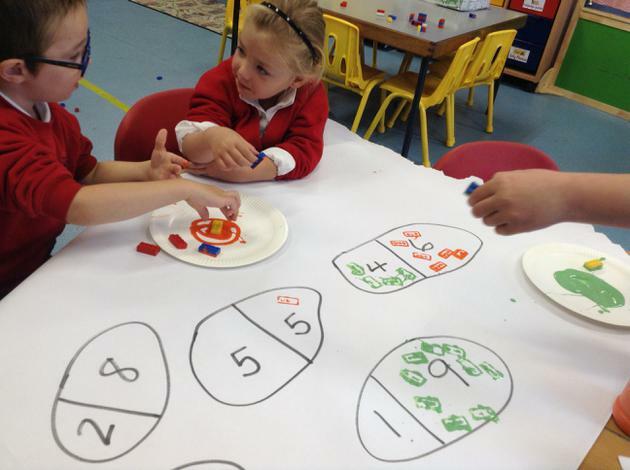 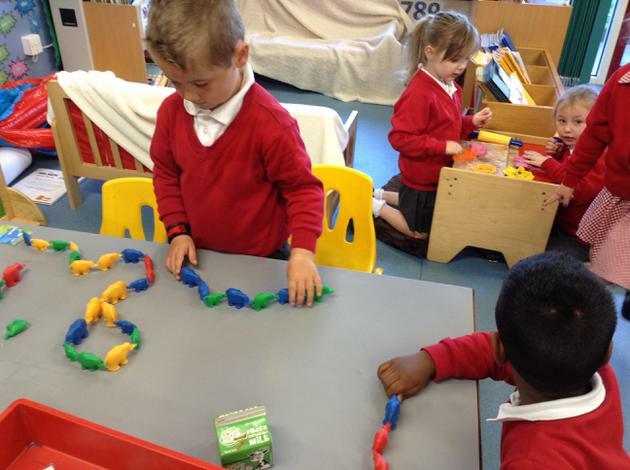 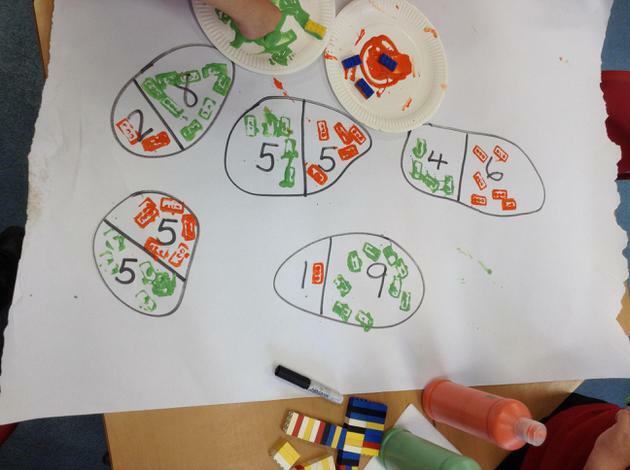 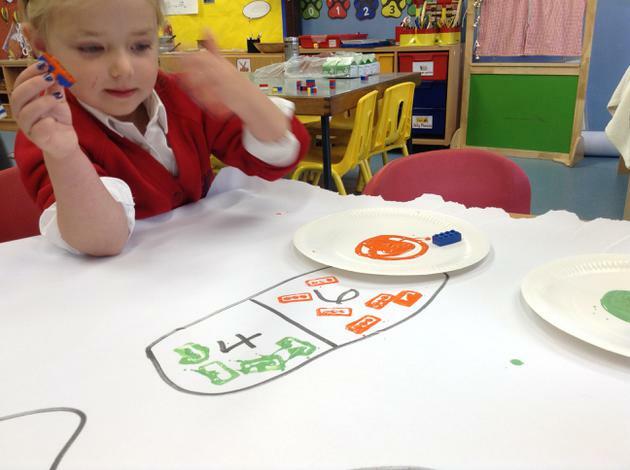 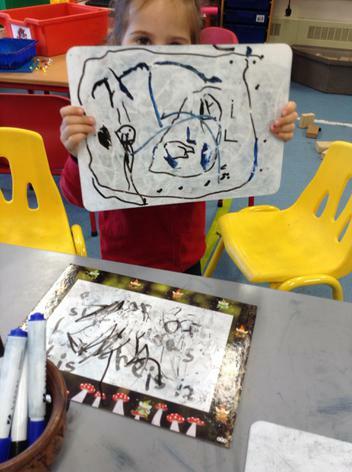 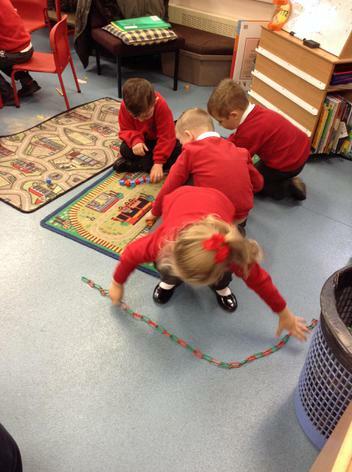 We also used different things around the classroom to make patterns. 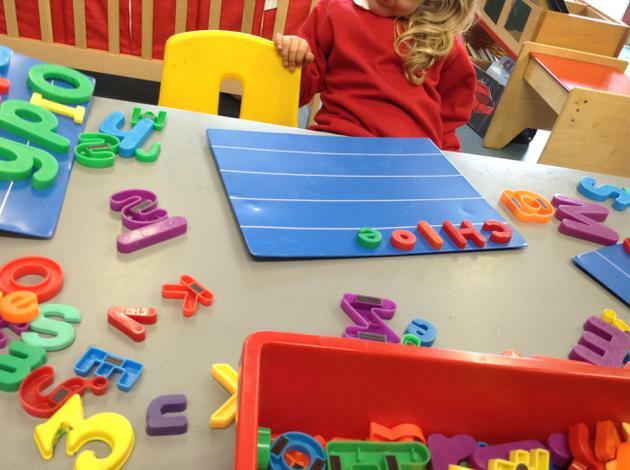 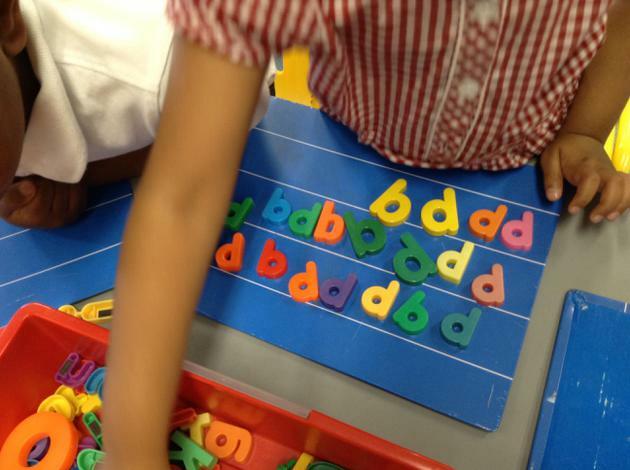 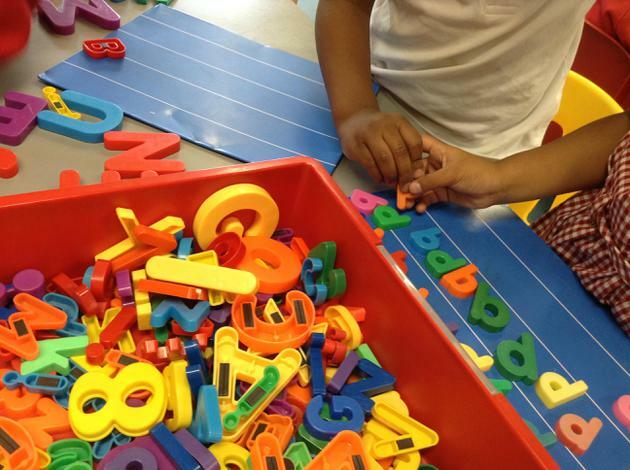 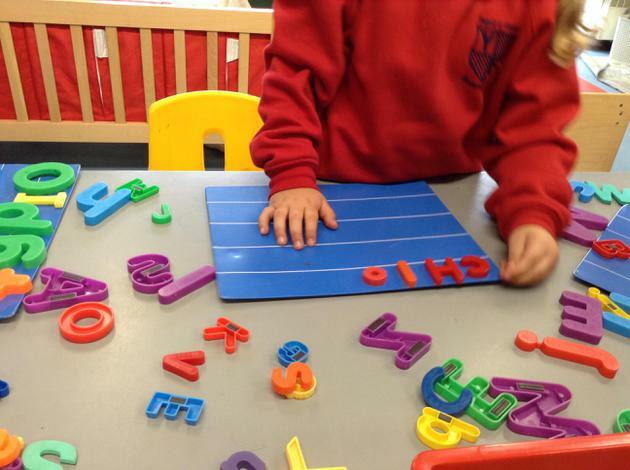 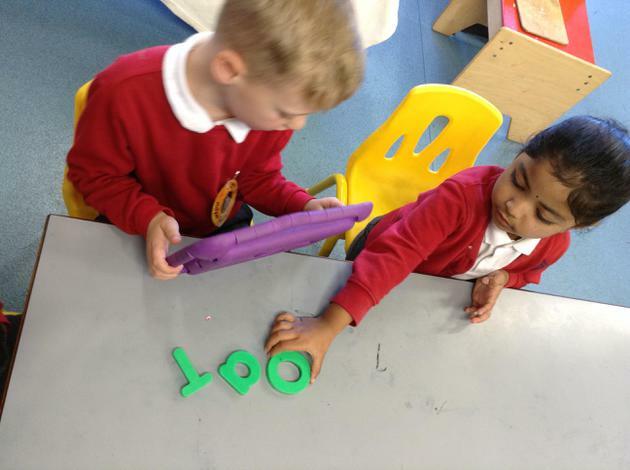 As our phonic knowledge gets better every day, we used magnetic letters to search for the sounds we know. 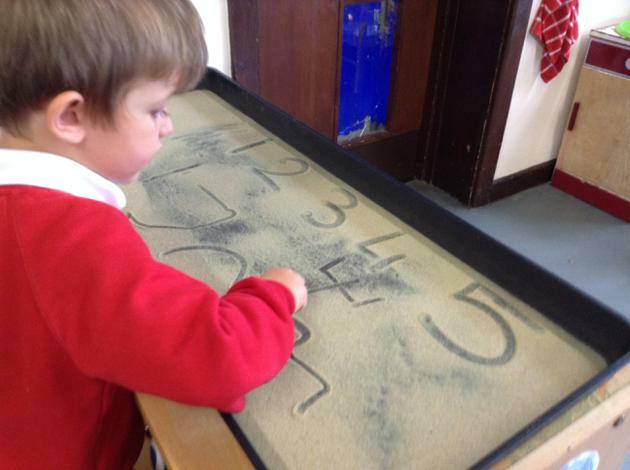 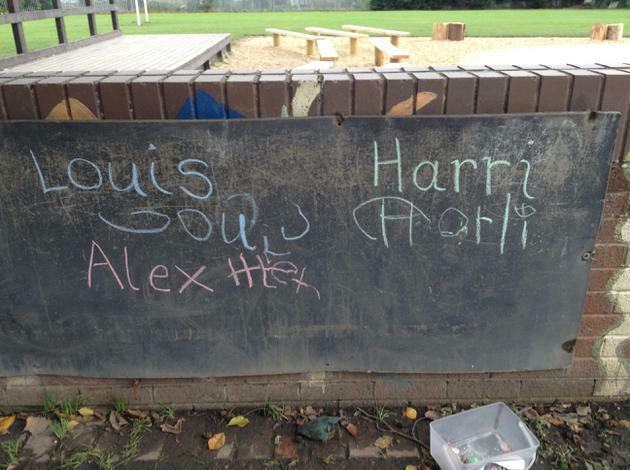 Some of us made collections of our favourites or spelt out our names, which we've been practising outside on the chalk boards. 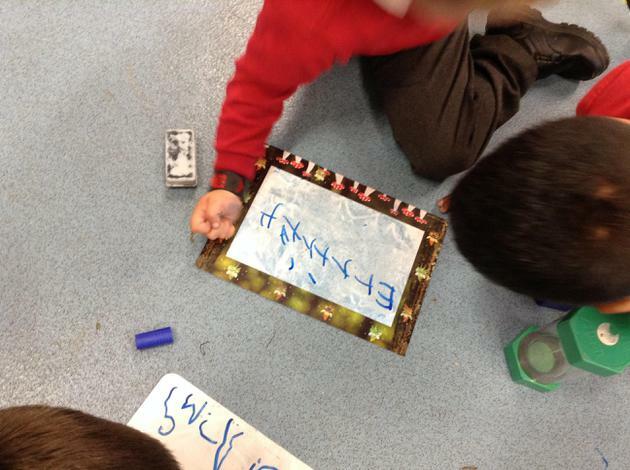 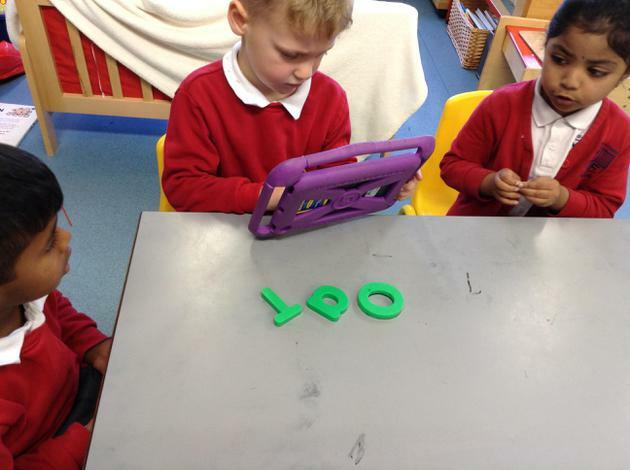 We've also used the interactive whiteboard to play a phonics matching game. 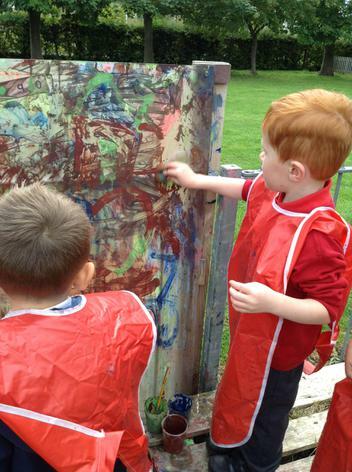 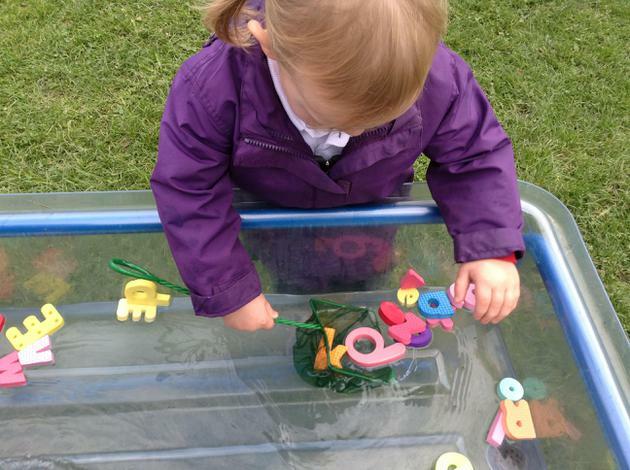 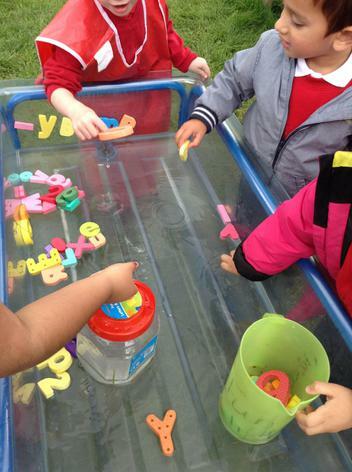 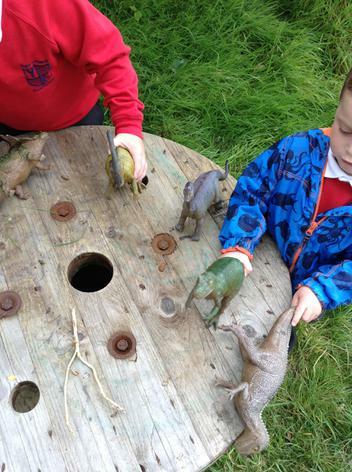 We love being outside: riding on the bikes, exploring in the water and the mud kitchen, building with loose parts and creating stories with small world houses and people. 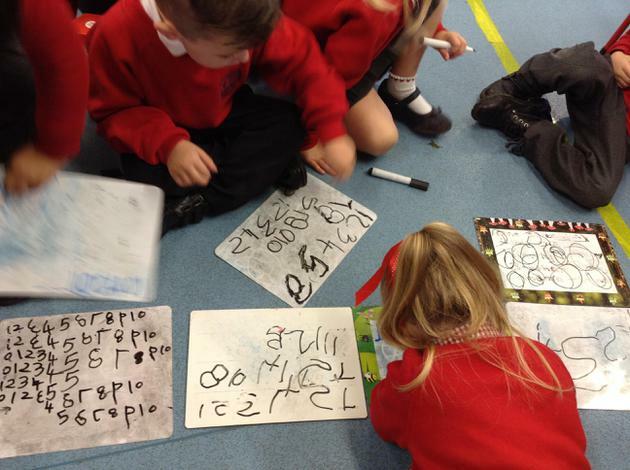 Our Talk 4 Writing sessions are going very well and most of us have learnt all the moves and the story. 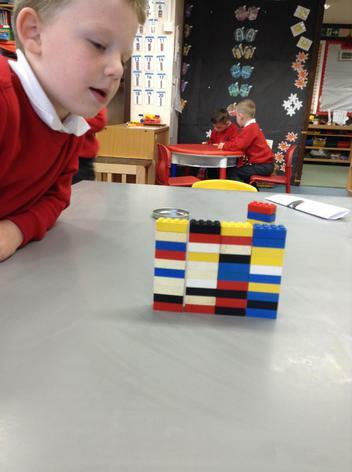 We have started to make up our own version of the story. 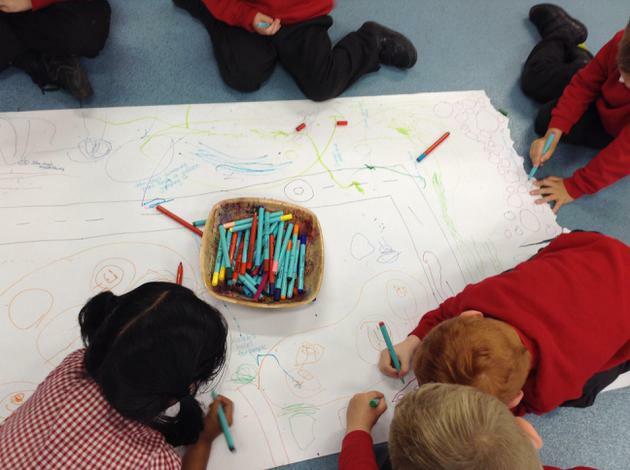 Reception Helicopter Story sessions are amazing. 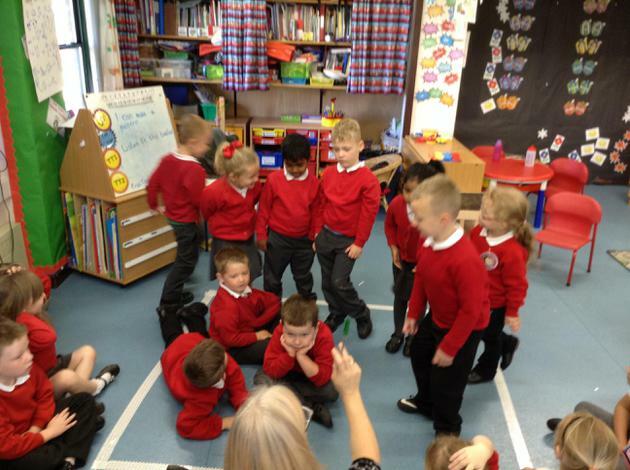 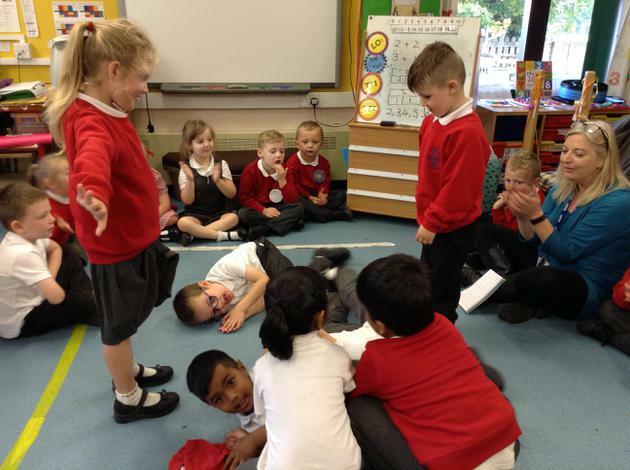 We tell our teacher a story and then act out the story. 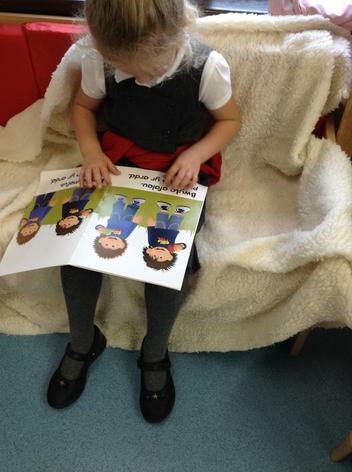 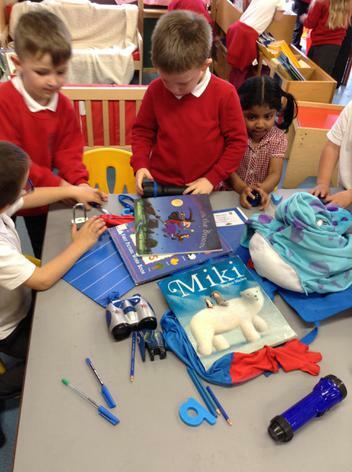 We have laughed a lot and have made our stories very good by using our Book Corner for ideas. 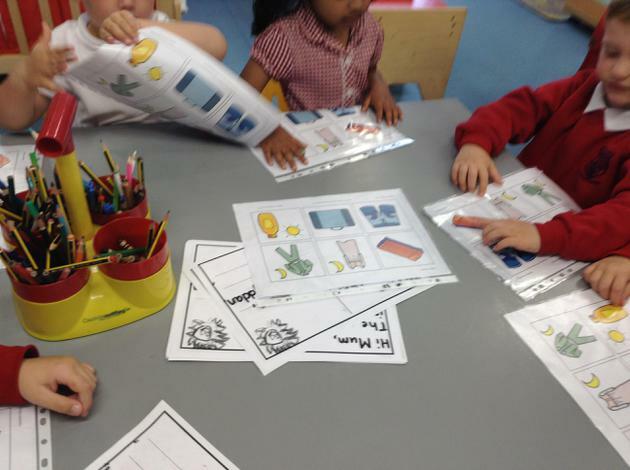 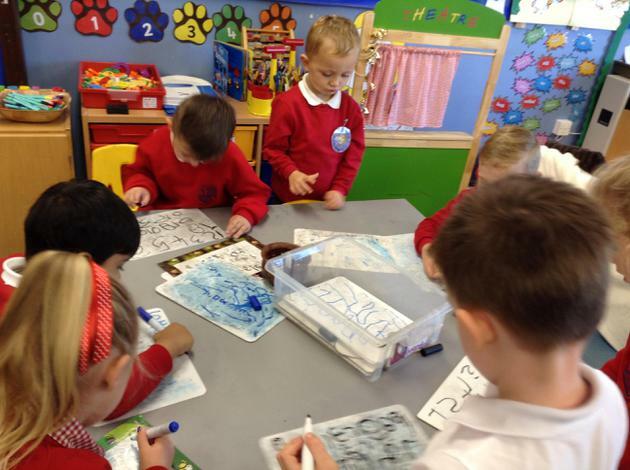 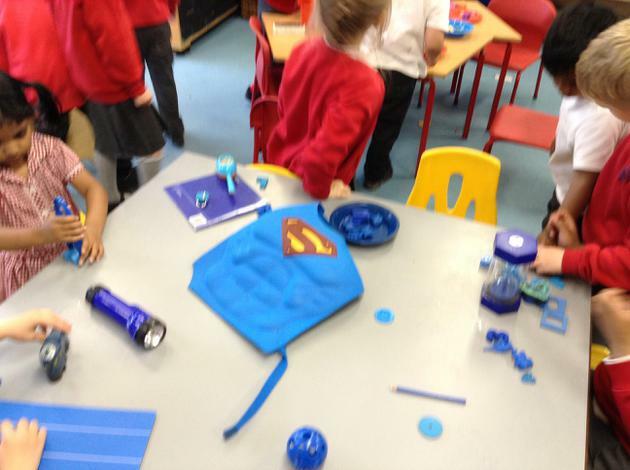 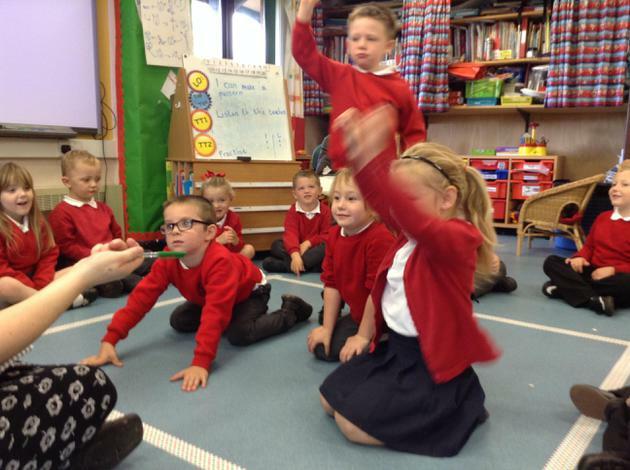 After developing our Welsh with Fflic and Fflac we searched our class for items that are 'glas' (blue). 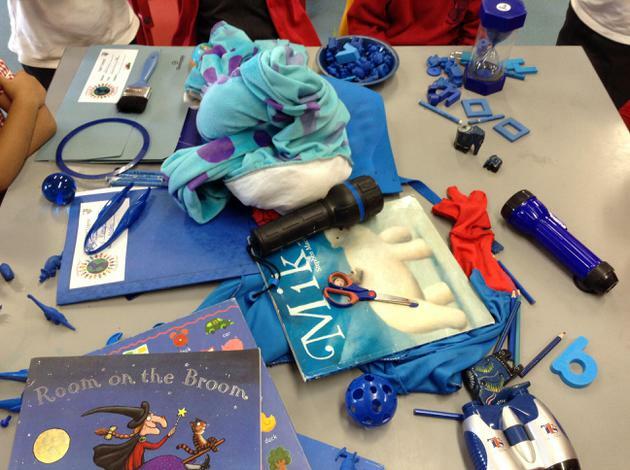 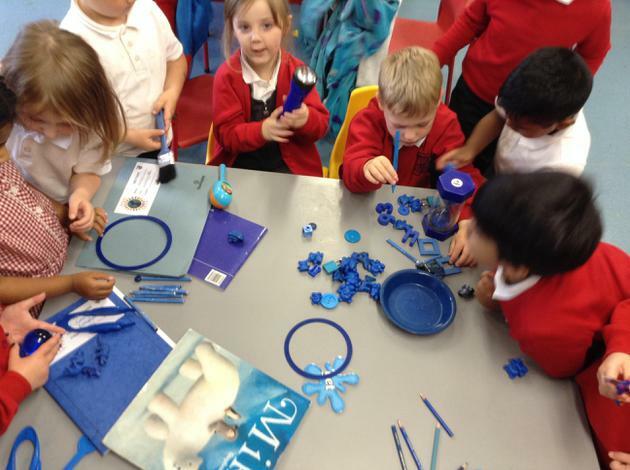 The hunt helped us discover all the things we have in one of our classrooms- but we had to remember to put just the blue things on the table. 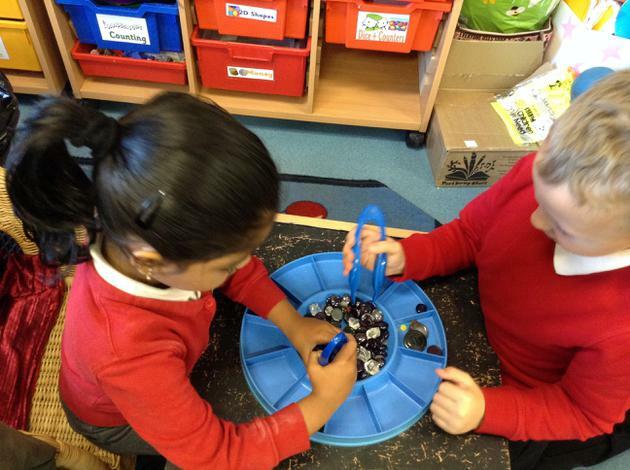 We found loads of things, we counted and talked about our favourites. 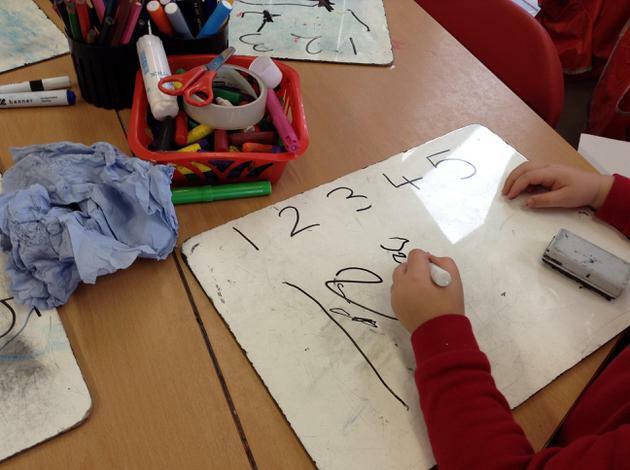 We used a timer to make sure we tidied everything away quickly. 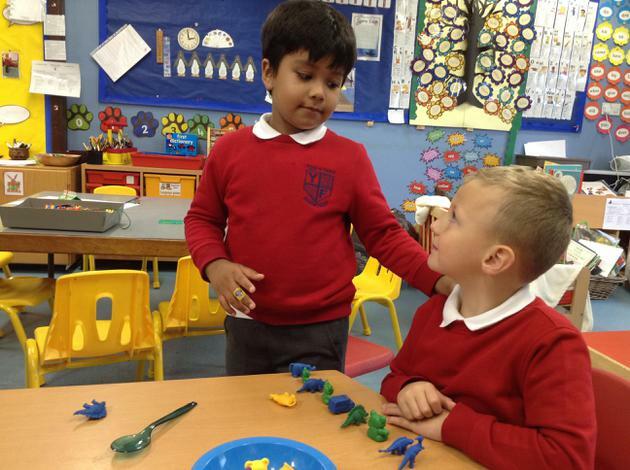 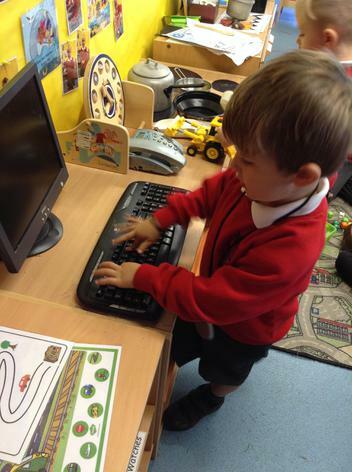 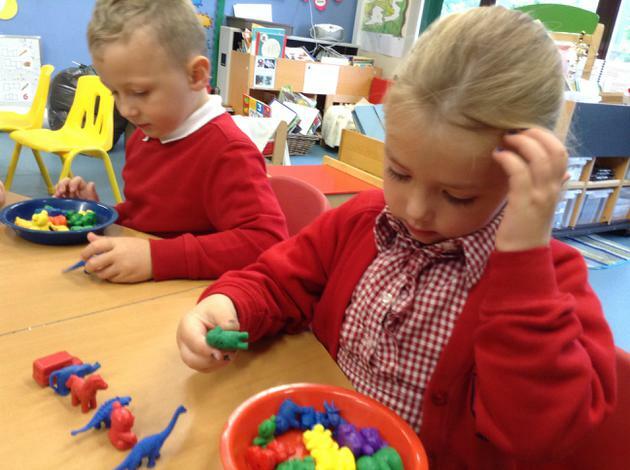 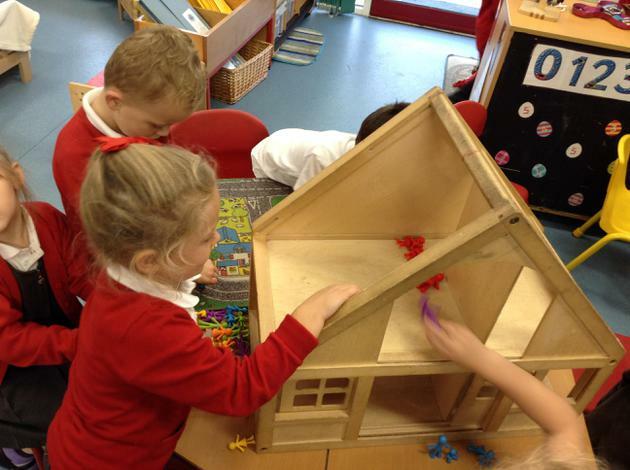 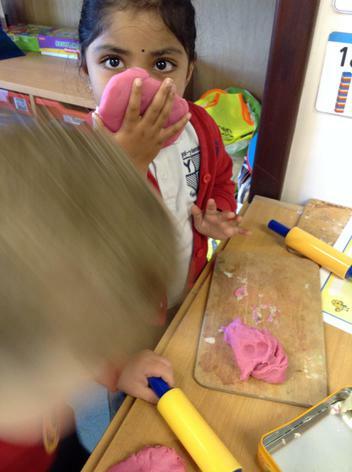 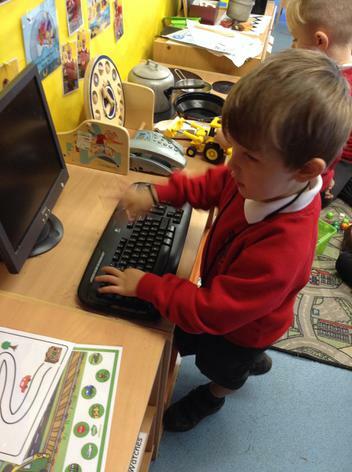 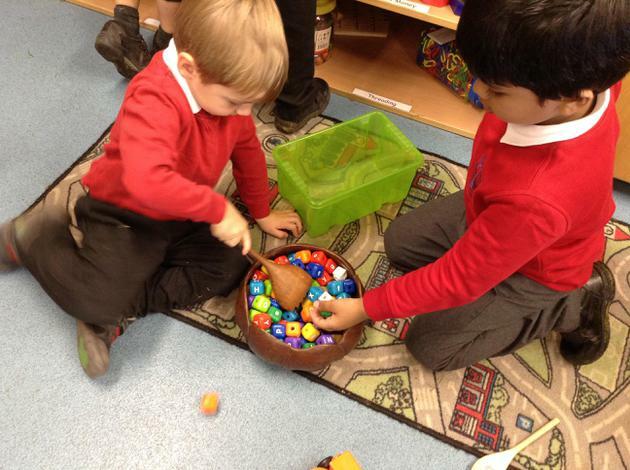 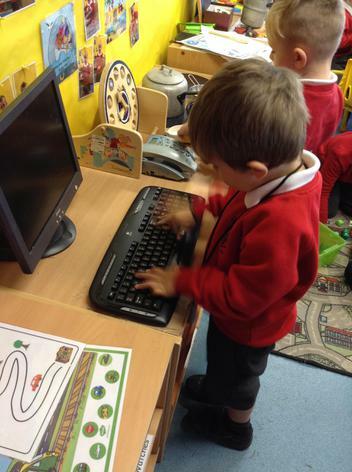 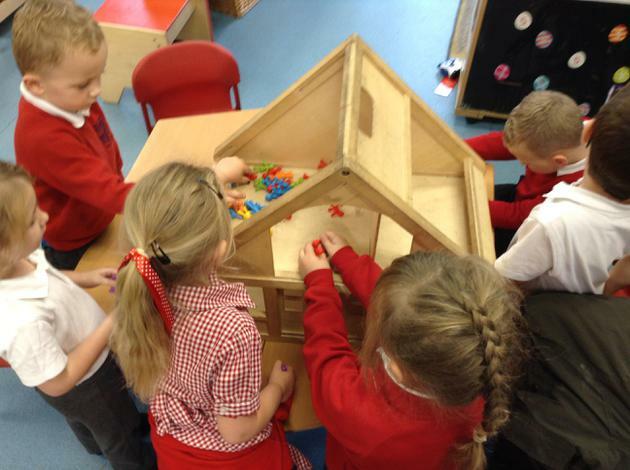 We have used the different areas in our class to play in: there has been a lot of meals cooked and shopping done on-line in the role-play, and many stories made up with the little people and the wooden house. 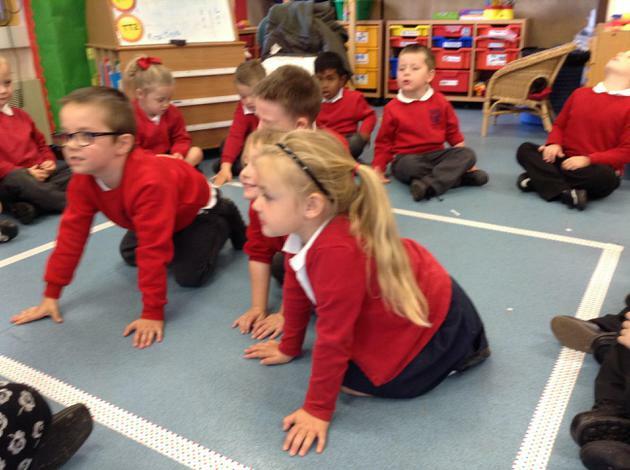 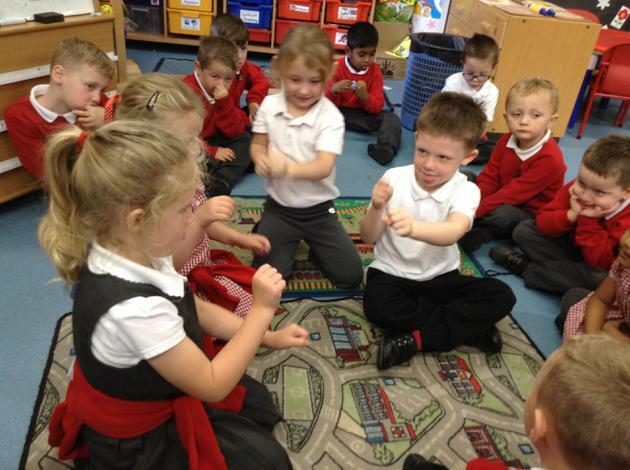 We've been singing lots of songs and have many favourites. 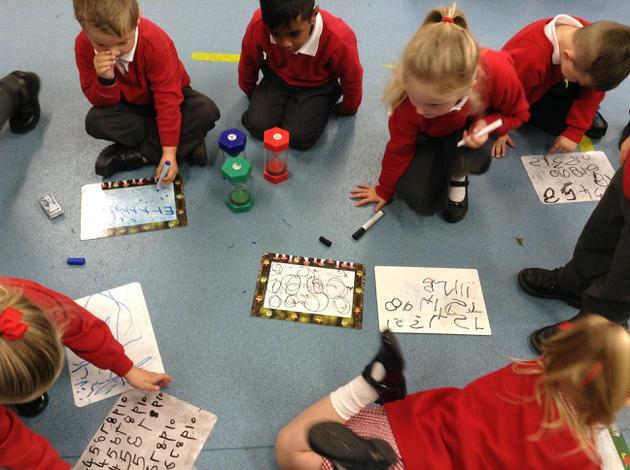 We used some of our instruments to play along with our enthusiastic singing.